U.S. Surgeon General Regina Benjamin has announced plans to step down in July after four years as the nation's top voice for public health. "My goal was to create a grassroots movement, to change our healthcare system from one focused on sickness and disease to a system focused on wellness and prevention," Benjamin wrote in an email to her staff. "With your help, that movement has begun." A new 253-page "Obamacare" rule recently issued requires state, federal and local agencies as well as health insurers to swap the protected personal health information of anybody seeking to join the new healthcare program that will be enforced by the Internal Revenue Service. 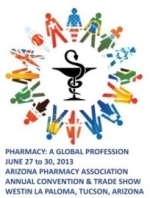 Just one week until the 2013 AzPA Annual Convention & Trade Show. There’s still time to join us in Tucson! Are you registered? Small-town pharmacist Robert McNeese was sentenced to more than five years in prison earlier this month. His crime: illegally dispensing oxycodone. Walgreen Co., the nation's largest pharmacy chain, agreed to pay $80 million to settle allegations it mishandled the same widely abused narcotic, the Drug Enforcement Agency announced. A 2012 Deloitte survey of 613 U.S. primary care and specialist physicians selected from the American Medical Association found that 19 percent of healthcare providers offer their patients a Web-based program to refill prescriptions online. While some retail pharmacies have been offering apps with prescription refill features for a few years, others have only recently added these offerings. The latest fight against a government investigation that might compromise customer privacy isn't coming from a phone or Internet company. It's coming from FedEx Corp. The operator of the world's largest cargo airline vows to fight any charges that may result from a federal investigation into drug shipments by illegal online pharmacies — bucking both government investigators and rival United Parcel Service Inc., which settled similar allegations. The National Community Pharmacists Association commends Gov. Rick Perry for signing into law two significant pieces of legislation in support of Texas small business independent community pharmacies: HB 1358, legislation that provides common-sense standards to pharmacy audits conducted by multibillion-dollar middlemen known as pharmacy benefit managers, and SB 1106, which provides transparency in generic drug maximum allowable costs for Medicaid plans. Not an AzPA member? Join the only statewide association representing all pharmacy professionals in all pharmacy practice settings. With over 1,500 members, we are a leading association of pharmacists spreading the news and events of our industry. After months of deliberating new rules for compounding pharmacies following the fungal meningitis outbreak that began last summer, the Tennessee Board of Pharmacy has approved new regulations for the drugmakers. The Senate Health, Education, Labor and Pensions Committee on May 22 passed legislation to improve the safety of sterile compounding and give FDA explicit authority over a new class of drugmakers called compounding manufacturers. At the request of Rep. Morgan Griffith, R-Va., who has taken the lead on drafting compounding legislation for the House Energy & Commerce Subcommittee on Health, APhA commented June 7 on a regulatory concept that relied on a draft Compliance Policy Guide that had been under development by FDA before the recent fungal meningitis outbreak. An over-the-counter pain reliever can also be used to deal with existential worry — anxiety that comes from thinking about death — according to new research from the University of British Columbia. Recently, one of the raging news stories concerned the problems cropping up over compounded drugs, specifically steroids, and contaminated doses reaching and poisoning patients. The FDA announced June 13 that it has found "bacterial and fungal growth" in two vials of preservative-free methylprednisolone acetate 80 mg/mL, 10 mL provided by a Tennessee pharmacy, but added that the agency has no knowledge of any cases of meningitis or "life-threatening infections" stemming from use of the product. Looking for similar articles? Search here, keyword MENINGITIS. The Supreme Court has ruled 5-3 that agreements in which a brand-name drug manufacturer pays another manufacturer to keep a generic version off the market can be challenged in court. The decision in Federal Trade Commission v. Actavis Inc. is generally a victory for the FTC and the Obama administration and is likely to lead to reduced drug costs for consumers. Misperceptions about opioid dependence, including how to screen for and treat the disorder, continue to persist for the public and for many clinicians, new research suggests. An online survey of 1,000 adults chosen at random plus 200 primary care physicians who were not addiction certified showed that almost half of the first group and a third of the latter said they believe that opioid dependence "is more of a psychological problem," such as a lifestyle choice, than a chronic physical illness. Disclaimer: The AzPA Pharmacy Flash is a weekly roundup of articles of interest to pharmacists and pharmacy professionals. This email may contain an advertisement of AzPA and/or third party products and services. Opinions expressed in these articles do not necessarily reflect the views of AzPA or its advertising partners. The AzPA Pharmacy Flash is compiled by MultiBriefs, a division of MultiView, Inc. Factual errors are the responsibility of the listed publication.